Last weekend Mach1 Motorsport travelled to the foreign round of the German Kart Championship in Lonato. The grade series started into its final ranked races on Italian ground for the first time on the South Garda Circuit. 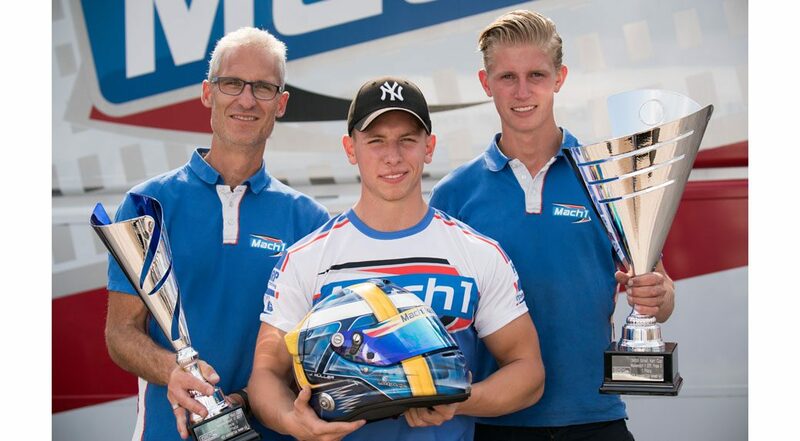 The team surrounding Martin Hetschel faced the challenges with eight drivers and achieved the vice title at the DMSB Shifterkart Cup with Julian Müller. The final event of the German Kart Championship presented itself highly international from October 20th – 22nd in Italy. The championship took place in Italy for the first time and attracted high interest right away. More than 170 drivers from 20 nations gathered on the 1.200m long high-speed track and dueled in the four categories. After dry conditions on Saturday, continuous rain followed on Sunday and pushed drivers and materials to their limits. A quartet of Mach1 Motorsport drivers started at the seniors. Cameron Boedler showed an especially good performance. 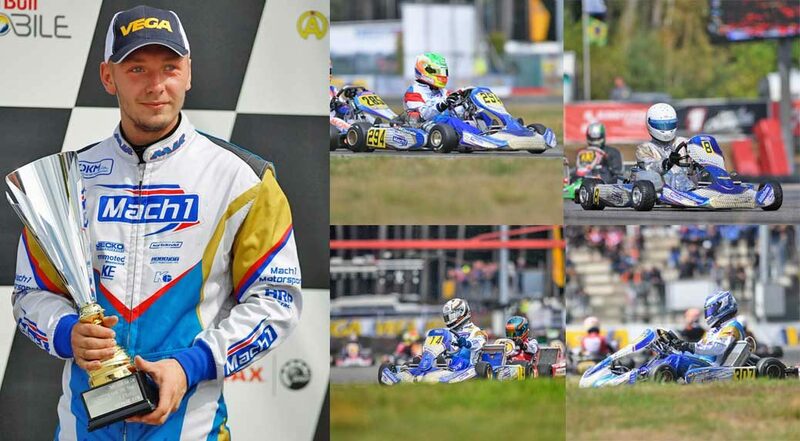 The German-Brazilian drove among the front field of the high-class participants of the German Kart Championship and secured the tenth starting position for the final races due to seventh and ninth places at the heats. The youngster was able to impress on the wet track as well. With 13th and 11th positions Cameron just barely missed entering the top ten and thereby celebrated his best DKM result this year. David Liwinski followed in his team mate’s wind shadow in the end. After messed up heats the Dutchman started into the first ranked race from 29th starting position and held his ground there with a strong catching-up race. He came in 19th at the first race and got even further at the second by coming in 17th in the end. Luka Wlömer and Marcel Weber had to deal with disappointments. Both Mach1-protégés broke new ground on the South Garda Circuit but weren’t able to achieve the coveted final tickets in the end. Daniel Stell started as a soloist at the German Shifterkart Championship. On Saturday things still looked liked an absolute success for the routine driver. He ended the heats on 11th and 3rd places and thereby the KZ2-driver highlighted his ambitions and took it up with the international top competition. Daniel started into Sunday from ninth place and finished the final races on 15th and 19th positions. Julian Müller started at the DMSB Shifterkart Cup in Lonato as the title favorite. The Cologne resident drove among the front field in difficult conditions and finished the ranked races on seventh and tenth places. At the finish line, he could rejoice about achieving the vice championship at the DSKC. Marcel Schultheiß caused a surprise. The Mach1 driver presented himself in top form at his DSKC-debut and drove among the forefront. From 13th place at qualifying Marcel already improved his performance during the heats to the seventh position in the interim rankings. Due to two sixth places at the races, the 21-year-old completed his successful debut. Tim Schröder also ended the weekend with a smile on his face. The Mach1-protégé showed a great upwards trend throughout the entire event and achieved his best performance of the season in the end due to 14th and 11th places. 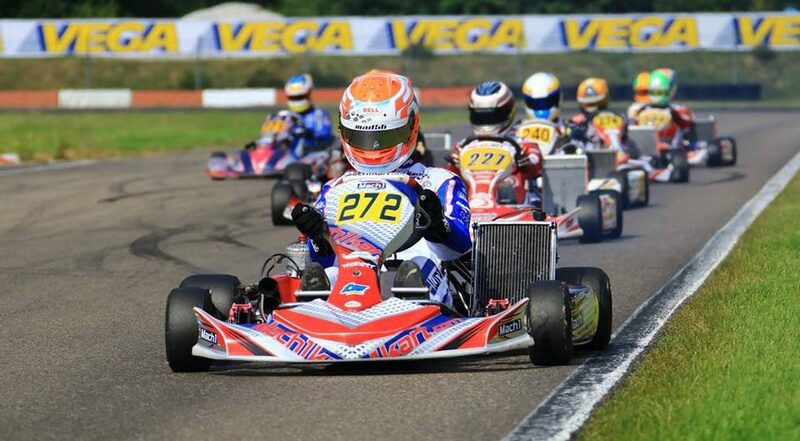 “An exciting year at the German Kart Championship is now behind us. The competition here in Lonato was strong – which is why I’m even happier about my team’s performance. The title was really close for Julian, but the vice championship is a great success too. Our speed was right at the other classes as well. It was a completely successful guest event for us here in Italy”, team leader Martin Hetschel summed up. Wackersdorf. The traditional brand’s protégés thereby showed great performances among the international and strongly manned fields of participants. Julian Müller took the overall lead of the DMSB Shifterkart Cup after a top performance. Prokart Raceland and received a lot of positive feedback. 152 national and international drivers started two weeks before the CIK-FIA Kart World Championship on the same track and offered a lot to the numerous spectators. youngster just barely missed entering the final races by ending up on 35 th place at the heats. At the seniors, four drivers started with Mach1 Motorsport. David Liwinski really called attention to himself due to a great performance. As 17th driver he was in midfield of the top class after qualifying,then really gave it his all during the races and raced forward. From twelfth place at the first race, the young driver drove forward to sixth place during the second race and just barely missed the cup ranks. Team mate Cameron Boedler also impressed with a great catching-up race. On the good 10th place after the heats, he had a falling out during the first race due to an accident. The German-Brazilian wasn’t deterred by this though and drove past his opponents during the second race due to clever maneuvers and finally came in 15th. Marcel Weber showed a solid performance as the fourth driver of the team and came in 27th and 25th respectively. to the top five. Daniel showed thrilling duels during the second race as well. Unfortunately he was involuntarily stopped due to an accident though and had to end the race prematurely. Marcel Schultheiß also started at the DSKM. Mixed heats prevented him from entering the final races though. Julian Müller experienced a perfect weekend at the DMSB Shifterkart Cup. The young driver showed his top form that has been continuing throughout the season in Wackersdorf as well and didn’t give his opponents any chances during the races. After a mixed Saturday, Julian started into the first race from third place and took the lead early on. Until the end of the race this didn’t change and Müller celebrated his victory. He didn’t let anyway take it away from him during the second race as well. He took the lead on the overall list of rankings due to his double victory and is now one of the big title favorites. Team mate Tim Schröder drove among midfield of the championship and missed the point ranks narrowly by coming in 17th at the second race. our drivers in front of a native audience”, said team leader Martin Hetschel contently. The attention of the international kart racing scene was on the half-time race of the German Kart Championship in Wackersdorf last weekend. 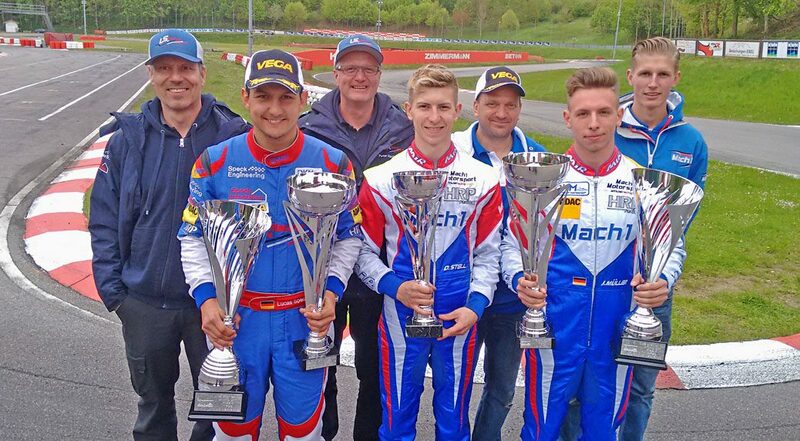 The factory team of German chassis manufacturer Mach1 travelled to the Prokart Raceland with eight drivers. They caused quite a stir especially at the shifterkart championship, but weren’t able to gain equivalent results in the end due to unlucky situations on the track in Germany’s highest kart racing series. 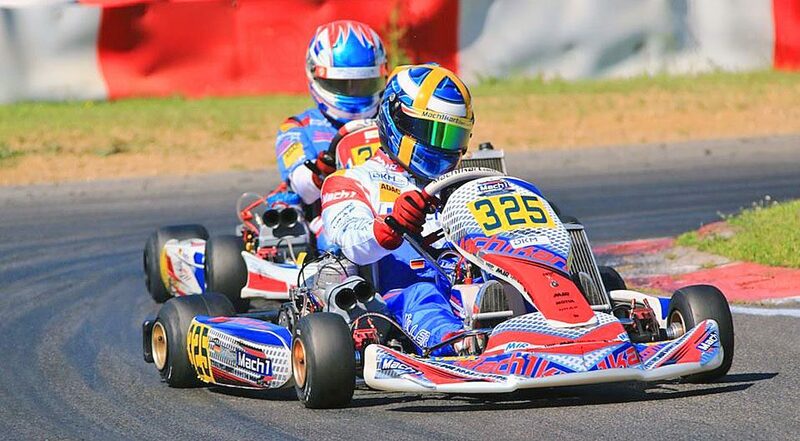 The second weekend of July was a guarantee for high-class kart racing in Bavarian Wackersdorf. 160 drivers competed against each other on the 1.190m long track in Upper-Palatine. 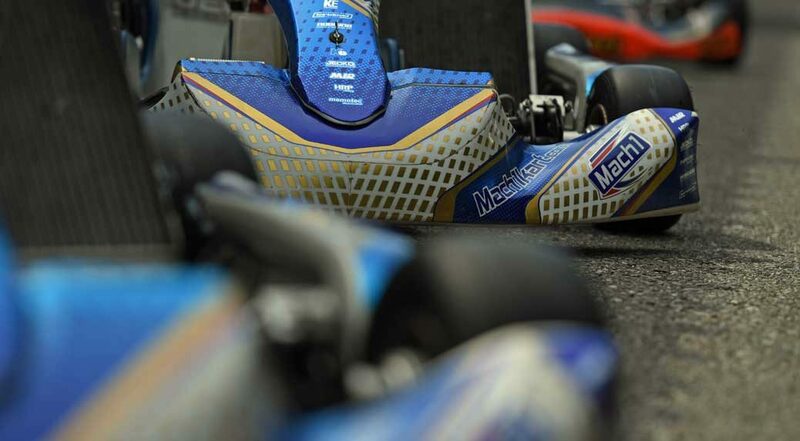 The racing division of the German kart manufacturer Mach1 started in three different categories and was able to hold their ground even with high grip conditions and midsummery temperatures. Four drivers started in the senior category. 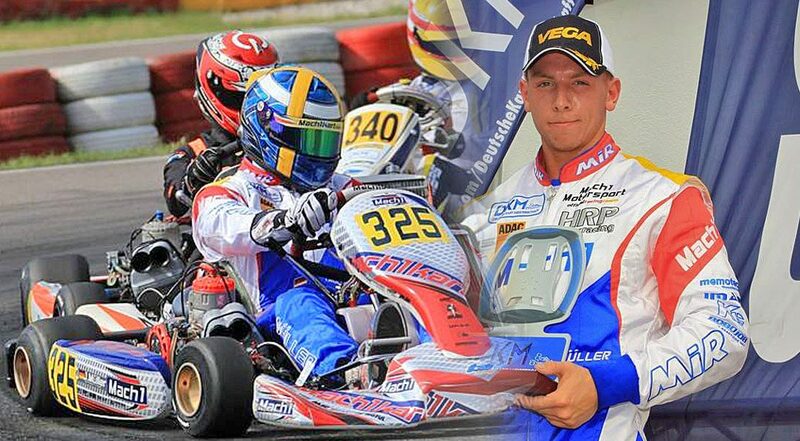 David Liwinski started off as the best Mach1-protégé at the German Kart Championship in the beginning. After 18th place at qualifying the Dutchman moved forward to 12th starting position for the first final race after good heats. During this the youngster lost some positions due to quarrels though and fell back to 17th place. A falling out during the second race erased all hopes of a further catching-up race afterwards. Cameron Boedler showed a solid performance. After 23rd place at qualifying he came in on the good 15th places at the crucial ranked races and thereby collected championship points in both races. Team mate Luka Wlömer also showed his potential due to a good catching-up race. From 28th position at qualifying the Berlin resident drove forward to 17th place. En Qi Wang presented himself greatly. The young driver from China celebrated a great premiere at his first ever OK race and directly qualified for the final races. In the end he had to end both races prematurely due to accidents though. Daniel Stell already entered an ambitious direction during qualifying of the German Shifterkart Championship by gaining ninth place. A falling out during a heat threw the routine driver back to 22nd place on the interim rankings though. The ADAC Kart Masters champion of the 2015 season had less luck during the races as well. Accidents prevented the shifterkart driver from showing his true potential. In the end he still achieved a good 16th place at the second race despite a time penalty. Marcel Schultheiß had to deal with bigger disappointments. Two fallings out at the qualification races threw the Mach1 Motorsport-protégé back to the end of the field and prevented him from entering the final races. Julian Müller showed his usual top form at the DMSB Shifterkart Cup. After two second places in the heats the Cologne resident drove among the front field during the first race as well and came in fourth. During the second race his way to the cup ended prematurely though. During the fight for third place Julian unfortunately had to park his kart in the off due to an accident. Tim Schröder gave everything at the DSKC as well. The Northerner showed a good performance by coming in 19th and 14th respectively and proved his competitiveness. “The conditions were really extreme today. The track conditions were really challenging due to the high grip. Our performance was right though – unfortunately there was a lot of additional bad luck during the races, otherwise Daniel and Julian would have been able to drive among the forefront too. Now we have to look forward positively. We can already do better next weekend at the ADAC Kart Masters in Kerpen”, team leader Martin Hetschel said in the evening. Last weekend the Mach1 Motorsport team travelled to the German Kart Championship in Kerpen. Martin Hetschel’s protégés showed great performances on the Erftlandring on Saturday and wanted to repeat these on the racing Sunday. In the end they had to deal with major setbacks but were then able to draw positive conclusions for the future. Beaming sunshine and filled up spectator terraces. 153 drivers from more than 20 different nations. A demanding challenge in Germany’s highest racing series awaited Mach1 Motorsport on the Erftlandring. All in all, the German chassis manufacturer sent in nine drivers in all four grade series. The juniors Luca Voncken and Julien-Noel Rehberg entered new territory: They started in front of such a setting for the first time and went up against strong international competition. Voncken did really well on Saturday and raced forward to 11th position at the first heat after coming in 27th at qualifying. Julien-Noel Rehberg also increased his performance continuously throughout Saturday and drove from 41st place at qualifying to 23rd and 20th positions at the heats. The junior duo didn’t have a lot of luck during the final races on Sunday though and had to deal with three fallings-out. At the German Shifterkart Championship, Marcel Schultheiß and Daniel Stell represented Mach1 Motorsport. Daniel Stell was on the right track on Saturday: After 14th position at qualifying he gained nine places during the first heat and came in fifth. A falling out at the second heat made him start into the final races from 18th place though. He then already fought his way forward during the first ranked race to 13th place and was aiming for the top five for quite a while during the second race. “Unfortunately the mounting of my radiator broke and I wasn’t able to go on driving”, said Daniel at the finish line. Team mate Marcel Schultheiß wasn’t able to enter the final races due to a falling out at one of the heats and therefore only was an involuntary spectator on Sunday. At the German Shifterkart Cup, Julian Müller started into the event on the 1.107m long Erftlandring as the overall leading driver. Saturday started promisingly. First he achieved fifth place at qualifying – then he won the first heat with a considerable advance to his opponents. Sixth place at the second heat brought him the fifth starting position for the final races. But a technical defect of the engine forced him to end the race prematurely during the first race already. He also had to deal with a falling out during the second race – a major setback. Tim Schröder on the other hand fought among midfield to keep close to the leading drivers – for him it was a successful event in Kerpen. Mach1 Motorsport sent a trio to start at the grade series of the OK drivers of the German Kart Championship. Luka Wlömer and David Liwinski kept a clear view despite the rough duels among midfield and held their ground. Liwinski was close to the top ten at the first race by coming in twelfth. Cameron Boedler tried to set a course as well and started into the final races from the strong ninth place after the heats. But just like his team mates he had to deal with some setbacks on Sunday. Technical difficulties caused him problems and he had to bow out of the first race. During his catching-up race at the second final race he was involved in an accident and wasn’t able to get past 27th place in a damaged chassis. The Mach1 Motorsport team now has three weeks to prepare for the event at the Prokart Raceland. With the pace and performance of Saturday in Kerpen they can really hope for good results in Wackersdorf. After an impressive performance within the framework of the ADAC Kart Masters, the racing section of the German chassis manufacturer travelled to Bavarian Ampfing again last weekend and took part in the kick-off to the German Kart Championship. Julian Müller caused a lot of joy among the team in the end with a DSKC victory as well as Daniel Stell with front places at the hard-fought DSKM. There was not much time to catch their breath for the Mach1 Motorsport team during the past days. 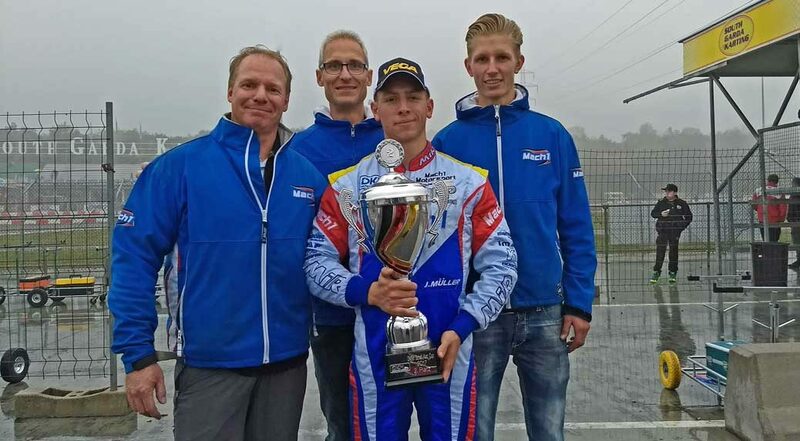 Without a long break the team surrounding Martin Hetschel came back to Ampfing after the kick-off to the ADAC Kart Masters and faced the challenges of the German Kart Championship. All in all, 160 drivers from 20 nations started at the huge event on the Schweppermannring and lived up to the name of the event. In best kart racing weather, eight drivers started at the races under the banner of Mach1 Motorsport and drove full throttle on the 1.063m long track. 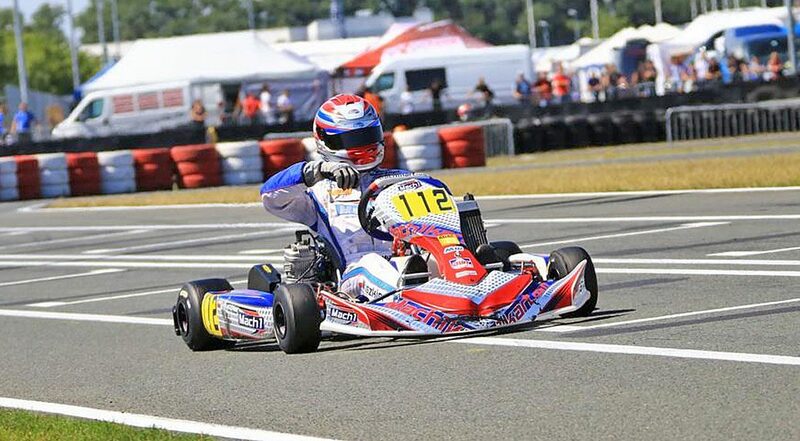 A quartet of OK rookies started at the seniors of the German Kart Championship. Four new drivers experienced international racing last weekend in Ampfing and gathered new experiences. Cameron Boedler showed the best performance. After 21st place at qualifying, the youngster drove forward to 18th place in the interim standings. During the first ranked race, the German-Brazilian had to let some opponents pass him by and fell back to 22nd place. During the second race Cameron found his rhythm though, fought his way forward and raced across the finish line on the good 14th place in the end. His team mates Marcel Weber, Luka Wlömer and David Liwisnki gathered lots of experiences in the new class as well, weren’t able to enter the final races in the end though. „We want to train and build up young drivers at the DKM. Cameron has done a great job, his lap times were on the level of the front drivers in the end. Our plan is to draw level with all four drivers until the end of the year”, Martin Hetschel summed up. Julian Müller showed a great performance at the DMSB Shifterkart Cup. The Mach1 driver already highlighted his ambitions at the beginning of the event due to fast times and additionally confirmed this with the third place at qualifying. During the heats the Cologne resident improved even more and achieved pole position at the first final race on Sunday due to a great double victory. In this, the ambitious race driver kept the upper hand as well and celebrated a great start-to-finish victory in the end. Julian then proved his fighting spirit during the second race. Despite a bent axle the Rhinelander established himself at the front of the field and finally came in on the impressive second place. He’s now leading the overall list of rankings after this great performance. Tim Schröder was also very fast. With Julian Müller, the experienced driver belonged to the DSKC spearhead and improved his position during the first race from 17th to 12th. A falling out at the second race prevented a further catching-up race of the Mach1 driver though. At the German Shifterkart Championship, all hopes were on Daniel Stell. After a great performance at the ADAC Kart Masters last weekend, he had a lot planned for his second Ampfing stop as well. After staying far behind his own expectations at qualifying, the Hammelburg resident started into the heats from 13th place. He then drove full throttle during the heats, but was slowed down by a collision that wasn’t his fault. Despite fastest lap times he fell back to 13th position again. During the following ranked race, Daniel returned to his original strength though. Due to impressive maneuvers the Mach1 protégé drove past his opponents and finally came in on the great fourth place. The German driver then fought for victory at the second race, but had to drop out of the race prematurely after a fight for positions. Marcel Schultheiß was the second Mach1 driver at the DSKM. The Biberach resident stayed behind his expectations at qualifying by coming in 36th, but then showed a clear upwards-trend during the races. In the end Marcel crossed the finish line on the 24th and 26th positions respectively and showed solid performances. „The good preparation of last weekend has now paid off. Julian was in his best form at the DSKC again and clearly highlighted our efficiency. With Lucas Speck and his LS kart there was another one of our products at the front field and finally made for two double victories. Daniel also impressed at the DSKM. The competition is really tough again this year. He definitely belongs to the top drivers and is going to continue to cause a furor”, team leader Martin Hetschel summed up in the evening. The team is going to travel to the Erftlandring in Kerpen in three weeks (May 26th – 28th). The second race of the German Kart Championship is going to take place there. 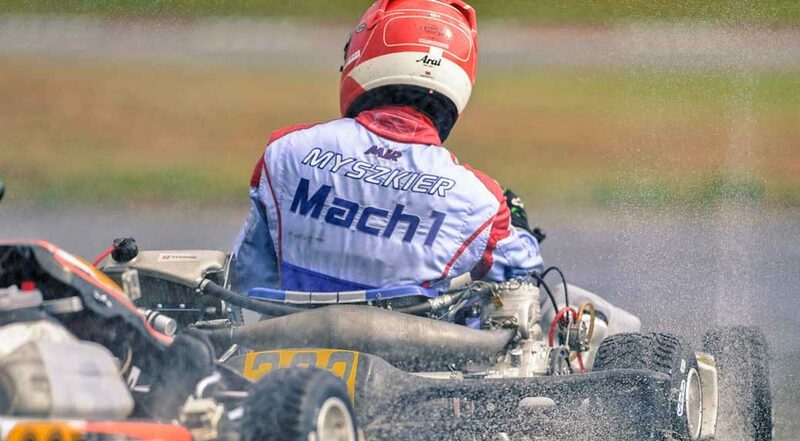 A thrilling season finish lies behind German kart manufacturer Mach1-Kart. Within three weeks, several highlights awaited them and Mach1 Motorsport showed its competitiveness. At the German Kart Championship and the ADAC Kart Masters, the drivers ended up on top positions. After the summer break, things happened really fast for Mach1 Motorsport. The team travelled all over Europe for four weeks. The first highlight was the Kart World Championship in Kristianstad. Douglas Lundberg and Pawel Myszkier started at the top class KZ and drove among midfield. Only a week later the team travelled to Oschersleben. The half-time race of the German Kart Championship took place at the Motorsport Arena. Swiss Marco Forrer and Julian Müller showed impressive performances at the DMSB Shifterkart Cup. Forrer finished the first final race on tenth position and achieved entering the cup ranks by coming in fifth at the second race. Second top ten driver Julian Müller finished on the great sixth and eighth places. The team then travelled from Saxony-Anhalt to Upper Palatine. There, the ADAC Kart Masters’ season finale took place on the Prokart Raceland. Haavard Hallerud from Norway drove for Mach1 Motorsport at the X30 seniors. Hallerud belonged to the title favorites in difficult weather conditions and ended the heats on fifth place. With further unsettled weather, he kept his position during the final races and won trophies in both races. Also successful in Wackersdorf were the Mach1 supported factory teams. At the bambini, DS Kartsport driver Luca Voncken ended up on the winners’ podium on third place. The four weeks of racing action ended on the Erftlandring in Kerpen. The finale of the German Kart Championship took place there. Beaming sunshine and filled-up spectator ranks made for best conditions. The Mach1 drivers experienced thrilling races. After bad luck during the first race, Myszkier and Lundberg fought their ways through the field from the back rows. After 23 laps, Pole Myszkier came in 11th and Lundberg 13th. Lundberg finished the Championship on the 10th place in the end. The Mach1 supported factory teams are going to start at the ADAC Kart final run in just a couple of days and only a week later, the IAME X30 International Finals are going to take place in LeMans. 12 drivers are going to fight for victories in the classes junior, senior, masters and super shifter there. The drivers are going to be supported by MLC Motorsport, Mach1 Racing UAE, Mach1 Karts Usa, MOTORSPORT24, Delré Racing Team and Mach1 Motorsport. Only a week after the ADAC Kart Masters in Kerpen, the Mach1 Kart drivers travelled on to Belgian Genk. At the half-time of the German Kart Championship they met strong fields of participants counting 187 drivers from more than 25 nations. In the end the team collected important championship points, although it did not go as planned for all pilots. Mach1 Motorsport started at the third event of the German Kart Championship on the 1.360m long track in Belgium with eight drivers. Two weeks before the finale of the European Kart Championship numerous international top drivers used the races as preparation, therefore the challenge for the drivers was significantly higher as usual. The German chassis manufacturer wanted to drive into the top ranks again at the DSKM and sent the driver Douglas Lundberg, Pawel Myszkier and Jordi van Moorsel on grid. Swede Douglas Lundberg travelled to Genk highly motivated after a strong performance at the Swedish Championship and already impressed with top times during the free trainings. Light drizzle threw him back during qualifying though and Douglas was only ranked 45th. During the course of the heats he was then able to fight his way forward and achieved entering the finals directly by coming in 26th. “In this strong field with such a bad qualifying result actually a direct qualification to the finals was almost impossible. Douglas has delivered a strong performance though, things can continue like this tomorrow”, team leader Martin Hetschel commented. Douglas had bad luck during the final races though. During the first race he started with four used tires and drove forward to 21st position. The Swede planned to attack during the second race. He started with four new tires and immediately gained some ground. He was then stopped by an opponent during the first lap. “That was very unfortunate. Douglas would have been a secure top ten candidate. We’ve gained a lot of knowledge that we can now use for the European Championship and we want to grow even more”, Hetschel continued. Next to Lundberg, Jordi van Moorsel and Pawel Myskier also started at the DSKM. Pole Myskier came in 24th at qualifying and was the best Mach1 driver. A falling out during a heat cost him the safe qualification for the final races though. During the repechage he lost all chances due to a starting accident. Jordi van Moorsel was also able to highlight the potential of the Mach1-Kart material during the heats. By coming in ninth he was really close to the leading drivers. Unfortunately it wasn’t enough to enter the final races in the end though. “Both of them have shown good performances as well. However, despite full application, both drivers did not reach the finals for the first time, which is very bitter”, Hetschel revealed. Five Mach1-protégés started at the DMSB Shifterkart Cup. The fastest drivers of the team were Marco Forrer and Julian Müller – both drove among the top ten during the finals. At the second race Forrer just barely missed placing in the cup ranks by coming in sixth. In the beginning, Müller neatly tied in with his performance of the ADAC Kart Masters. Unfortunately he was slowed down during the final races due to technical problems and came in only seventh and eighth. “Marco’s weekend went nearly perfect. He has constantly increased during the championship and delivered his so far best result in Genk. Unfortunately Julian had to fight with technical problems and had to enter the races with his training engine”, Hetschel added. The team is going to travel to Genk again in two weeks. Then, the finale of the CIK-FIA European Kart Championship is going to take place there. Mach1 Kart will participate with five drivers in two classes.